Trail Designs offers the best designed, lightest, most efficient, and easy to use 3-fuel (alcohol, wood, esbit) stove systems in the world. This is a 1.35L (1350ml) pot which is a great size for up to two hikers. It also includes a custom made cozy which keeps the heat in and saves fuel. 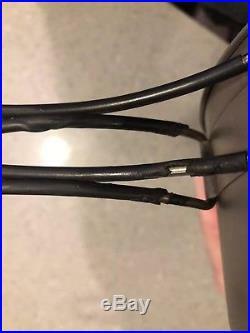 The first photo is from TrailDesigns website and the rest are the actual items. I have a big appetite when hiking so used this solo as well a when hiking with a partner. The wide shape of this pot uses less fuel than tall and narrow shapes, is easier to get food in and out without spilling, easier to stir the bottom as you cook, plus easy cleaning because you can get your hand into it (vs narrow pots). Why struggle with a tall/narrow pot at the end of your hiking day? This can be configured in three waysonly carry what you need for the fuel type(s) you want to use. However, everything (except stakes for wood burning) fits into the pot if you want to have all three for max flexibility. And, for the lightest option ever, pack out the pot/cone (6.7oz) plus inferno accessories (2.4oz) and dont carry fuel at all. Dont worry about fuel bottles, Esbit tablets, or alcohol burners. In this case, your whole system is a crazy light 9oz and no fuel carry. This model is the Toaks UL 1350 in very good used condition. 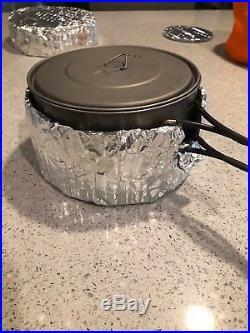 Be aware this is an ultralight pot. It is plenty strong but will have some flex in the walls. This just requires a minimal amount of awareness in packing to keep it in good shape. 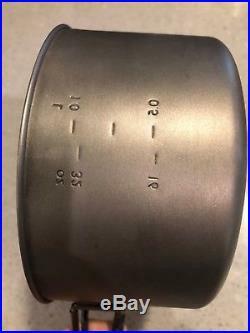 UL Titanium pot and lid (5.2oz). 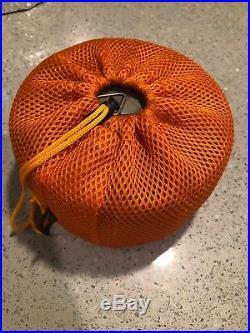 Toaks stuff sack (0.8oz). 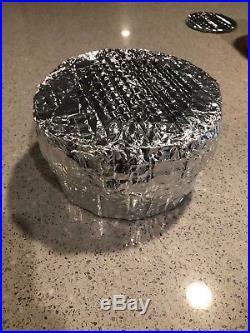 Custom cozy which can replace the stuff sack (2.4oz). Titanium cone and tyvek sleeve (1.5oz). Inferno insert for efficient/cleaner wood burning (1.8oz). 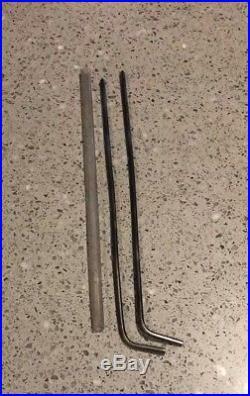 Two titanium stakes for wood burning mode or raising the pot for taller burners (0.6oz). 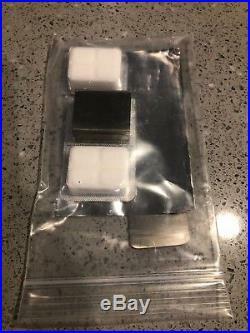 New, unused titanium GramCracker solid fuel kit (0.4oz). Three Esbit fuel tabs. 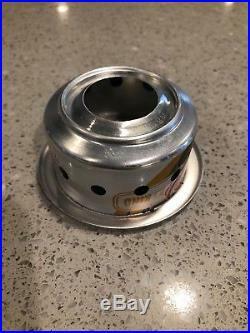 New, unused 12-10 Alcohol Burner. Note: alcohol fuel bottle NOT included. Trail Designs sells one that fits with the cone inside the tyvek sleeve. Or just use your own. 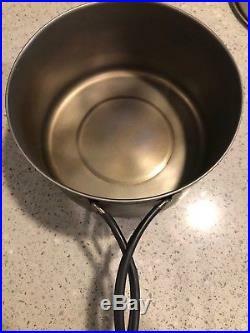 Note: System is in very good to excellent condition; titanium cones, pot, and stakes have patina and minor wear from use; coating on pot handles has some melting from heat but does not affect function or use; pot bottom has some minor waviness from heating and use. Full size Caldera Ti-Tri performance that packs in this pot! The Sidewinder comes with the the alcohol and esbit stoves featured in the standard the Caldera Cone, but also allows you to burn wood! No other system gives you this kind of fuel versatility at these weights. In addition, the Sidewinder will store in your pot! If you value packability, but DON’T want to sacrifice the efficiency the standard Caldera/Ti-Tri provides by isolating your pot from the enviornment, this is the rig for you. This Sidewinder comes with the Toaks UL 1350ml titanium pot and optional frying pan lid! 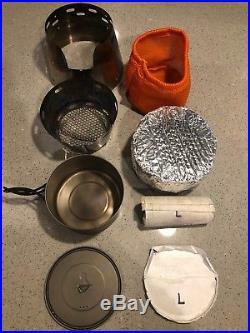 The Sidewinder system includes everything pictured including the Toaks UL 1350ml pot, Ti-Tri titanium cone custom sized to fit the pot, the titanium GramCracker solid fuel kit, the lightweight aluminum stove, fuel bottle kit with measuring cup, Tyvek sleeve to protect your pot, and two titanium stakes for wood burning mode. The Ti-Tri Sidewinder is designed to be an alcohol and esbit cooking system that will support wood fires. If you would like to kick your wood fire capabilities up to the next level, you might want to consider adding the Inferno insert pictured above. The Inferno Insert and grate system, when used in conjunction with the Sidewinder facilitates better air flow and a much cleaner, more complete incineration for your wood fire. In addition to the lower grate system providing air flow under your fire, it also directs additional fresh air above your fire providing an “afterburner” effect giving you more complete combustion…. And like the Ti-Tri Sidewinder…. Everything fits in the pot! In the interest of facilitating Leave No Trace practices, Trail Designs also offers two styles of titanium floor plates to go under your Ti-Tri systems in wood burning mode to help prevent scorching of the ground. 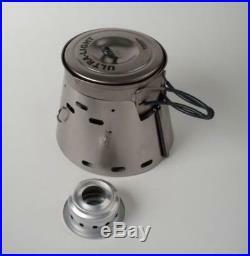 The item “$160 ULTRALIGHT Trail Designs Titanium 3-Fuel Stove SystemTi-Tri Sidewinder+Pot” is in sale since Thursday, January 3, 2019. This item is in the category “Sporting Goods\Outdoor Sports\Camping & Hiking\Camping Cooking Supplies\Camping Stoves, Ovens & BBQs\Camping Stoves”. 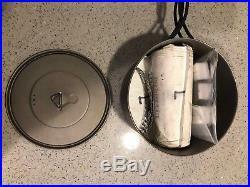 The seller is “5-nomads” and is located in Bishop, Georgia. This item can be shipped to United States.